The magical feeling of being pampered and total relaxation is the secret!!! Amongst the green gardens and breath taking view of the Golan Heights at Ma’aleh GimlaGAMLA you will find the cabins of the Marom family. Come and stay at the ``Simha Ba`Kerem`` guest house, where we offer you a different kind of holiday to stay in our unique Mongolian tents. At the site we have 2 tents, which have been specially designed with a lot of space to fit a large double bed, above which there is a large round window for you to look up at the stars. Here we have 4 beautiful and luxurious wooden cabins for your country holiday. The cabins are fully furnished and have a double luxury Jacuzzi, air conditioning and are very spacious. HER AND ME – A DREAM COME TRUE FOR A WEEKEND AWAY OR A FEW HOURS OF PURE PAMPERING A double Jacuzzi facing the Golan Heights and the Sea of Galilee while you stay at our basalt stone made cabin, is designed exactly for you. It goes without saying that the music, candles and incense are also part of the package. At Moshav Ma’aleh GimlaGAMLA we have 4 large and spacious wooden cabins with a double Jacuzzi facing the breathtaking view of the Yehudia Nature Reserve. The Moshav is situated on the Golan Heights and overlooks the Sea of Galilee, Yehudia Nature Reserve and the GimlaGAMLA Antiques. These lovely wooden cabins are located around the end of the Moshav, and are placed just in the right place for your relaxing, peaceful and private stay. Each cabin is luxuriously furnished and is equipped with all you need and more. The pampering Jacuzzi with the wooden terrace facing the Sea of Galilee is one of the highlights. At Moshav GimlaGAMLA amongst the spectacular view of the Golan Heights in the north of Israel, you will find these two luxury wooden cabins, suitable for couples only. The cabins are very spacious and are fully equipped for your stay and are just what you need for your romantic get away. 3 guest rooms with jaccuzi Facing the Sea of Galilee and the Galilee Mountains in Ma’aleh Gaimla are the wooden cabins of “Bashan in the Golan” with a private swimming pool. The cabins have been designed especially for you and are fully equipped for your stay. Come and enjoy the most challenging rafting in the Galilee – fun for all the family – floating down the river, past banks of natural greenery, feeling the cool refreshing waters, glimpsing the myriad birds and wild animals that make it their home. Mag`dl Shams facing Mount Hermon will play Bblodan nature. Bblodan second nature and equipped spacious suites suitable for families and couples. Each suite is equipped high-level holiday fun! Yard Bloudan nature spacious balcony overlooking the Hermon Mountain View, manicured garden, seating and BBQ area. The View. A unique single family home with a stunning view in the heart of the Hermon, opposite the Birkat Ram Lake in the Golan Heights. Bmg`dl Shams few minutes from Mount Hermon, are housed in luxurious cabins have amazing overlooking amazing views. Enjoy the swimming pool area and you can have a luxurious restaurant with an authentic Druze special events can be held. Hotel Moon Center, luxurious accommodation Majdal Shams, a Druze village near Mount Hermon. B``mrcz Irh`` 10 guest rooms equipped with high-class for couples and families. Site gym, swimming pool, restaurant, Jacuzzi spa, and more. In the North of the Golan Heights, amongst the beautiful views is the ``Narkis`` boutique hotel, with the country atmosphere. At the hotel we have 21 spacious rooms, each furnished and modernly designed which are suitable for families and couples. A few minutes away from the Hermon Mountains, are the beautiful suites which overlook this beautiful landscape view. The suites are secluded and are furnished to a very high standard with a jacuzzi, television, internet connection and many more extras which will make your country holiday the perfect one. The site is suitable for romantic holidays and for families with children as well as group tours. 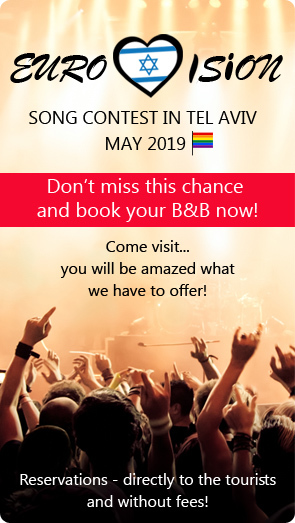 Come and be our guest at this beautiful apartment hotel with a balcony overlooking the breathtaking Hermon Mountains, accompanied with a spoilt for choice Israeli breakfast. The hotel accommodates 9 units, which are suitable for families and couples. They are each furnished to a very high standard and have air conditioning. At the entrance to Nahal Orvim Nature Reserve, facing the breathtaking view of the Galilee, are two luxurious, well equipped log cabins suitable for either a romantic break or a family holiday. The cabins have a log fire to pamper you in winter when you get out of the hot tub and air-conditioning to refresh you in the summer. If you bring children, there is a safe and secure luxury gallery. Our breakfasts are renowned and are brought to you in the cabin. Here at “Biktotayim” we invite you to leave the `rat-race` behind and come for a dream holiday at our unique and enchanting log cabins. two amazing suits at Ramat Hagolan. In any swits there is jaccuzi, badroom, sitting area amd balcony. In a small, young village on the northern Golan Heights, facing a wild, ancient landscape, nestle two special log cabins. The cabins are 80 square metres (approx 95 sq. yards) in size, with a luxurious gallery, and offer visitors a most pleasurable stay at this dream location. The cabins are in a fruit orchard which gives them absolute privacy and tranquility. Zimmer rose cliff located in the Golan Heights settlement of two crows Cliff wood cabins are fully equipped for families and couples pampering. Includes a huge Jacuzzi colorfully illuminating the water and foam. Manicured garden and amazing views! At the foot of the cliff in the northern Golan Heights, is an enchanting beauty spot. In the northern village of ``Matsok Orvim`` (Crows` Cliff) are three luxurious African Tents surrounded by breath-taking landscapes of the Naphtali Hills, the Hula Valley and the Golan Heights. The air is cool, clear (even in summer) and this, together with the dramatic sunsets, will leave you feeling peaceful and relaxed. Located within an Israeli settlement, the Rimonim Hermon Holiday Village is a small holiday resort built in the style of a Swiss alpine village, surrounded by the breathtaking scenery of the Golan Heights. The village consists of 44 wooden A-frame cottages scattered around the grounds of the property. Cottages are rustic in style and spacious in size with many of the cottages being suitable for up to 5 persons. Surrounded by the breathtaking scenery of the Golan Heights, the Rimonim Hermon Holiday Village is a small holiday resort built in the style of a Swiss alpine village. Here at 1000 Meters high, you will enjoy the cold summer air not like anywhere else in Israel. Beautiful wooden cabins hand made by the landlord, are fully furnished with a terrace and seating area and in the garden, fruit trees and flowers overlooking the beautiful view of the Ahula Valley. At the foot of Mount Hermon in the community Nooh- Ati``b Delay between snow-capped mountains and cherry orchards. Hunters boutique hotel is located, overlooking the spectacular view of the valley and Mount Hermon green lawns and streams flowing round Hsna.hmlon is a tourist area and includes Neve At``ib family vacation units, and for couples, large lawn, hammocks, spa, and barbecue area. ``Golan B`rama`` – with luxury wooden cabins at 5 star standard for religious and non religious couples. This country inn is fully furnished and designed for those who will only settle for best. In the heart of the Golan Heights you will find Moshav Odem which houses 3 magnificent Units, suitable for romantic weekends for couples. These units are fully furnished and come with a double pampering jacuzzi. Each unit has its own balcony and is surrounded by fruit trees, with a comfortable seating area and a huge Spa jacuzzi for your enjoyment. Guest rooms for country lodging at Moshav Odem – Golan Heights Country accommodation at Moshav Odem at the North of the Golan, near the Odem Nature forest is a. 20 minute drive from the Hermon Mountains site and a 10 minute drive from the Ram springs and Tel-Dan. In the forest of northern Golan, 10 luxurious wooden cabins and rooms. Just close the cabin door behind you, and enter a romantic, relaxing atmosphere. Candles, a giant jacuzzi, the wood-burning stove in winter and enchanting details will make every moment enjoyable. When your morning pampering is over, we`ll deliver breakfast to your door. In addition, we offer 42 country-style units. 3 luxurious wooden cabins with jaccuzi for couples or families. In a hillside in the Golan Heights overlooking the Sea of Galilee, we`ve built with love and care our 10 Guest Cottages suitable for both families and couples, and surrounded them by a large garden. At the center of the beautiful Golan Heights, near to the Sea of Galilee, there are 3 luxury wooden cabins, where you will find an intimate and romantic setting. Each cabin has its own terrace and private garden with a barbeque area. For your romantic vacation with a view of the Sea of Galilee we have 2 new wooden cabins for couples. We also have 2 spacious wooden cabins for families. Each of the cabins is fully furnished with air conditioning and all face the breathtaking view. Five minutes away from the Sea of Galilee and the old Mountains of the Golan is Be`katzeh Ha`har (meaning at the edge of the mountain). Here you will find a combination between today`s technology and the quieter environment of 400 years ago, which makes your stay at our cabin all the more unique. Our beautiful wooden cabins house a Jacuzzi facing the view of the Sea of Galilee and are fully furnished and offer you a romantic luxurious holiday with all the peace and quiet that you desire as well as your own private swimming pool. The Ramot Resort Hotel is a picturesque resort full of delightful corners, colorful trails, grassy areas and lookout points with spectacular views of the Sea of Galilee and the Golan. The resort’s lobby-bar and panoramic restaurant are perfect for reveling in the breathtaking scenery and offer rich buffets and exquisite meals in a variety of styles. At the foot of Ramot, neighbors the cabin `` Pisgat ha`osher`` which means the peak of happiness. The cabin is secluded and suitable for a romantic holiday with all its luxuries. Suitable for couples/couples with one child. Four romanitc cabins for couples. Great for honeymoon or birthdays!!! Jacuzzi next to the bed and a shower for two. From your cabin, you have a fantastic view of the Kinneret. On Moshav Ramot overlooking the Sea of Galilee you will find the ``Musical Gardens`` 3 wooden cabins especially for your romantic holiday. The Cord Cabin; the Flute Cabin and the Bell Cabin are all suitable for loving couples. 2 wooden cabins with jaccuzi, sitting corners and 2 bedrooms. Indiana Jones – Camping and Indian tents in the North of the Golan. This is a new experience here in the Golan !! If you are a nature lover and enjoy camping trips, we invite you to this different kind of experience. Looking for a pampering vacation? You`ve come to the right place. Michal`s house, in the heart of a private farm in Sha`al, Ramat Hagolan, in a quiet and special rural atmosphere Three beautiful and romantic suites with a spacious double Jacuzzi. Accommodation is suitable for couples only. The Yehudiya Forest Nature Reserve, covering 66,000 dunams (16,500 acres) in the central Golan Heights, is shaped like a hand, the “wrist” of which is in the Bethsaida Valley and each of whose “fingers” is a flowing stream. The land slopes moderately westward from 400 to 100 m above sea level. The name “BeDerech HaTeva” wasn`t chosen randomly. This is a place with magical secrets of pampering, spa, accommodation and the continuous enjoyment of nature; together with hosts who do everything to make your stay perfect; so that from the moment you arrive until the moment you leave, you will be energized by luxury and pampering. At Aniam site overlooking the Sea of Galilee Will be hosted on 2 new stunning log cabins. In the clear air and open spaces enjoy the perfect combination of luxury and romance. Spacious suites designed with privacy suitable for couples and families. We invite you to be our guests in two spacious, enchanting and luxurious wooden suites. The suites were built lovingly and thoughtfully by Ahuva and Ronny Gol. We have utilized our years of experience as visitors in Guest Rooms to design the suites in such a way as to let you enjoy a family holiday, which is also pampering and romantic. You can enjoy the garden and the magical, relaxing atmosphere. “Lev” - a magical place in Moshav Aniam – only two hour`s drive from the centre of Israel – but in a different world. Far from the rush and noise and traffic-jams, you will find an enchanting place - “Lev – HaMakom Shel Leah” (Heart – Leah`s Place) Between the Ayit Waterfall and the Zavitan River, at the highest point in Moshav Aniam are three exclusive suites which are tastefully decorated and with every amenity for your comfort. Large windows give a panoramic view of the expansive plains of the Golan Heights and there is a huge deck with a view of the Sea of Galilee, the Hula Valley and Mount Hermon. At Moshav Ani`am in Ramat Hagolan, there is three cabins- biktot vanilla. the cabins suitable for couples and families. at the summer there is a privet swimming pool. PALGEI MAIM – ACCOMMODATION ON THE EL AL RIVER BANK On the Avnei Eitan Moshav in the Golan Heights you are invited to stay at one of our 3 guest houses. The guest houses are air conditioned, furnished and offer you the silence and tranquility you need for your holiday and the breathtaking view of the EL AL RIVER BANK in the Golan Heights. Country lodging at its finest with the newest wooden cabins. The holiday that you always dreamed of is right here. The cabins are suitable to accommodate couples or families with up to 8 children and also for religious families. The cabins are furnished to a very high standard -A parent’s room, living room and a room for children. At Moshav Avnei Eitan there are 2 cabins made of wood especially for your country holiday, suitable for families and couples. Each cabin is furnished to the highest standard with 2 bedrooms, Jacuzzi, air conditioning, LCD television, wireless internet and kitchen with utensils. Moshav Bnei Yehuda Golan Heights through spectacular landscapes and pastoral atmosphere To arrive at Villa Olivia `` ``. Large villa, equipped and decorated with everything needed for an enjoyable vacation. Courtyard villa Jacuzzi luxurious spa, swimming pool and charming seating areas. Lan in the Golan, which is part of Kibbutz Eiv Zivan, can offer you the perfect country holiday with bed and breakfast (traditional Israeli breakfast) and our finest personal service to make you feel at home. CAMPING SITE– CHAN 4 FOR 4 SEASONS New at the Golan: Car park for traveling families and groups. Guest rooms and clubs and all other services for groups. We have jeep 4X4 rides on offer, which is idealistic for group bookings Group cycling tours Private riding is available too.